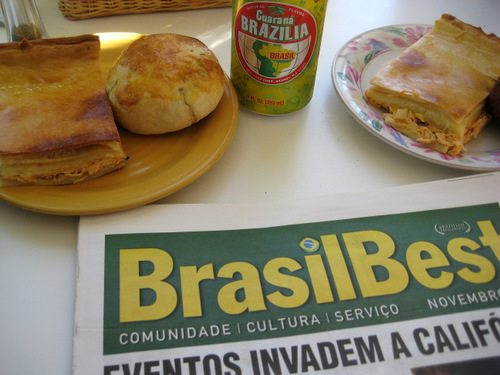 Ever since A and I went to Brazil together a few years ago, we always try to eat Brazilian food when we’re together. 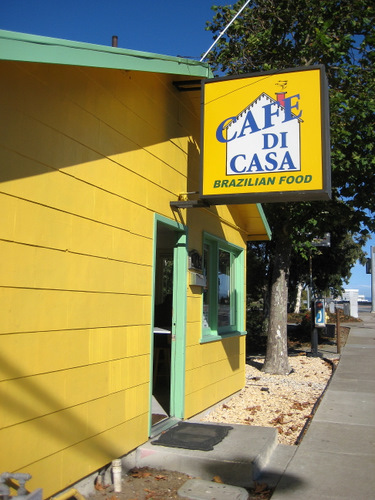 Man, did we have a direction fail when we tried to get to Cafe Di Casa. It’s in South San Francisco, but there’s a big difference between Airport Blvd and South Airport Blvd. So be warned! But eventually, we made it. It’s a teeny little place with a small and slightly confusing menu. They only really have one hot dish a day. And then they have some other more appetizer type things on a daily basis. We were the only non-Brazilians in there. Everyone else looked like total regulars. We were clueless. We weren’t interested in the the hot entree of the day, so we both got some chicken pie. It actually kind of looks like lasagna, but it’s made with pastry instead of lasagna noodles and shredded chicken. It may be odd to describe, but we both thoroughly enjoyed it. We also got a couple of doughey pastry, fried croquette, meat pie types of things. Some had meat, some may have been veggie with potatoes and such, but we enjoyed them all. And we thoroughly loved our guarana soda. Oh, it brought back so many memories! And the guy behind the counter was super nice!